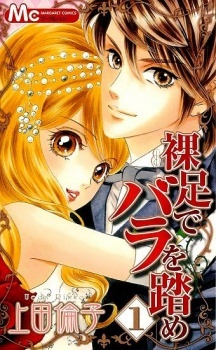 Hadashi de Bara wo Fume was published in English as Stepping on Roses by VIZ Media under the Shojo Beat imprint from April 6, 2010 to February 5, 2013. First, let me say my opinion of this manga when first seeing the cover and the plot summary. I thought that, " Well, it's gonna be one of those marriage agreement thingy and one's gonna fall inlove w/ his/her partner... since this is shoujo might as well expect it. But, I'm gonna give it a try... just one try, ". I WAS WRONG. SO WRONG IN SO MANY WAYS. I never knew this manga had the PYSCHO thingy in it which was so beautifully expressed! The characters portrayed themselves very well. Especially, Nozumo and Soichirou. At first I was like, " Yep, Nozumo's attitude's gonna be like this, " but NO! It was on a total different level! And personally, I didn't like Soichirou's predictable and overly used character at first, but THEN! It was like I was slowly falling inlove with him. I couldn't even choose between the two of them! Both drawn maturely and professionally. Sumi's character was very lovely as well. It couldn't go wrong in any way. She was so mature. I looked up to her in every chapter of the manga. The manga started simple at the beginning and suddenly confusing but confusing in a GOOD way. At the end of the manga, I didn't even expect a plot twist! My journey reading this manga was full of emotions. Some happy, some sad and some I just don't know how to express. I was really sad that it ended at Chapter 57. I don't even care if it goes until 500! I finished this manga in a day and regretted how I only read it until now. This manga is on par with Faster Than a Kiss for me. I really love this manga and people should give it a try. And of course, my overall review of this manga is a perfect 100. To start out with the positive aspects to this manga, what probably pulled me into the story was the way the fashion or clothes are drawn. This is as the story is set in the Meiji era and therefore it is interesting to see both very beautifully drawn traditional Japanese and Western clothing incorporated into the manga. Sumi (lead female character) also clearly comes over as very pretty through the drawing style. Yet sadly these few perks are unable to outweigh the problems which I have found with this manga. Beginning with the pacing of the story, it truly throws the reader around, which does not help at all to try to create an emotional connection between Sumi and the reader, or for that case any other character either. Partially also the pacing's fault is that the character development appears as inconsistent. Characters seem to change, but only to revert back the next instant, something that is obviously confusing. Moreover each character does face their own traumas or radical changes in personality, however these seem poorly expressed, through the fact that it is used, but without great depth to it and just cast aside or ignored when of no use to the plot. This is also what makes the story so predictable from the very beginning, the plot is character driven, but the characters themselves are predictable! It should also be noted if one does make use of psychological profiling of the characters, it should be consistent and "reading in between the lines" should let the reader try to figure out how each character is influenced by an event and why they act in a certain way. The essence of ambiguity and uncertainty to how the antagonists in the story would act, is something that is completely lacking in this story. These are just some of the spoiler free inconsistencies I would like to mention in the story, as there are many spoiler related things I could add, especially about how there are quite a few occurrences that are just plain out not fitting to the time period. There are many things that can stretch the boundaries of a manga in a good way, but for this manga which is supposed to be rather serious, there are just too many loose ends to be understood as charming. The most disappointing thing about this manga is especially that it could have so much potential for a more enthralling and gripping plot, as well as characters. If you are looking for a manga that will grip your emotions and keep you internally screaming at the most important moments, then this is certainly not the one. I would not recommend to read this manga, as there are so many better shoujo romance mangas out there, that deserve so much more praise then this one, and have far better developed plots and characters that are able to take hold of the reader without letting go. I feel like the manga could have been better, instead it was mediocre. Sumi, the main girl is just so irritating! She constantly causes trouble by her naiveness and then nobody blames her. Also, she is a master of shogi, she can't even read, how she can play shogi, does she just recognize the characters as the same? Her dislike of roses seems infrequent as well, she freaks out at seeing roses sometimes but other times she seems fine and fear of roses is questionable, *spoiler* she doesn't remember being a baby so how she still have her fear of roses when she was abandoned in a field? Unlike most shoujo manga I did not get that mushy feeling I get when reading them. Instead, my most prominent feeling was that of being creeped out by Nozomu's actions, yandere guys are scary as heck! He os overly obsessed and ends up being a total creep. I mean he saved a RICEBALL from her, the heck, who does that?! There was also the fact that *spoilers* it was too predictable. When I first saw the picture of Aiko and Nozomu's mention that Sumi resembles his mother, I knew already that they were siblings. Also tying in to Nozomu's insanity, after finding out, he still wants to marry her. Sumi's "brother" was also questionable, he seems like a nice guy, taking care of orphans but he still uses Sumi and leech off her, as well as constantly getting into trouble, it was not until the end did he seem to act like an actual brother. I feel that the background stories were something that were impromptu, that it was just made up on the spot and the ending was kind of rushed. The author barely touched on Souichi's background and his family and Keiko, the maid that was a spy sent by his cousin suddenly seem to give up her spy. I seriously feel that the best character was Komai, the freaking butler, that's kinda sad. The redeeming part of the manga was the art, it is not anything really special but still pretty and the best part of the manga, the story was not bad either but doesn't seem to have enough reasoning backing things up. All in all I would rate the manga a 6.5/10, too bad MAL dont have decimals.